Starfinder Class Playtest: Last Call! The Starfinder Character Operations Manual Playtest is just about to wrap up—but if you haven't yet made a character with these playtest classes and given us your feedback, there’s still time! The open playtest period for the biohacker, the vanguard, and the witchwarper classes ends on Wednesday, January 16. So if you'd like to help us provide the best new classes possible for this late 2019 release, grab the free playtest PDF, make a character or two, and run them through their paces. Then, share your thoughts via our surveys or playtest forums. More information about participating in the Character Operations Manual playtest is available here! And if you'd like to read our thoughts about some of the feedback we've already received, including a few design aspects we already know we’ll address, check out this previous blog. With your help, the stars are the limits for these new classes. We can’t wait to hear what you think! Starfinder Class Playtest: Two Weeks Left! 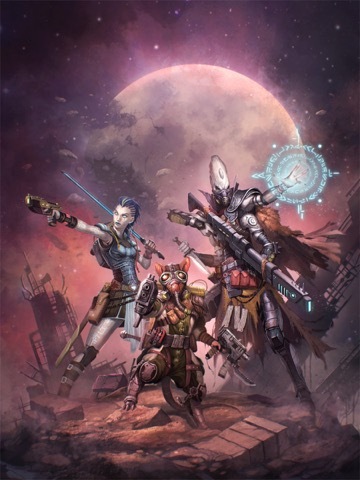 The year might be brand new, but the Starfinder Roleplaying Game's Character Operations Manual playtest is still rolling full steam as we work on providing you with the best new classes possible for this late 2019 release! There are 13 days left in the open playtest period for the biohacker, vanguard, and witchwarper classes. If you haven't already downloaded the free playtest PDF, made some characters, and run them through their paces, you still have time! The playtest ends January 16, and we need your feedback to make these classes the best they can be. Test out a character in a home game or in Starfinder Society, and then share your thoughts via our surveys or playtest forums. Links to both of those options, plus more information about the Character Operations Manual playtest are available here! Meanwhile, here at Starfinder HQ, we're already sifting through the feedback you've sent us so far and discussing the ways we might improve the classes as a result. Based on what you've told us, there are a few design aspects we already know we'll address (though these are far from the only community-driven changes we're making!). For the biohacker, we've heard that the mechanical balance between the classes' two key ability score options—that is, whether you choose to play an Intelligence-based instinctive biohacker or a Wisdom-based studious biohacker—is uneven. As we sculpt the class's design toward its final version, we'll endeavor to make both options equally viable. For the vanguard, you've let us know that the class lacks a way to spend Entropy Points—the pillar of the class's core entropic pool ability—at 1st level. Designing key ways to do so will be a top goal as we polish that class. For the witchwarper, we've heard your requests for a robust array of new spells specific to this class's flavor about pulling from infinite alternate realities to affect the surrounding world. We're already hard at work writing new witchwarper-only spells of all levels, from damage-dealing spells to battlefield control spells to buffs for the witchwarper and his allies and more. These design concerns just scratch the surface of the possibilities for the classes' final versions—and there's still plenty of time to make your voice heard. For those who have already participated in the playtest, we thank you, and to those who plan to still send us feedback: we eagerly await your thoughts!